Opor Recipe Chicken - Hai meet again with my full time admin This recipe will review the surrounding archipelago cuisine is tasty and delicious for sure. Chicken curry's turn ya know that you can start from the material to weave. When talking about cooking this one is pretty cool yes because I love looking at cooking it because the taste of the ingredients is very special especially very distinctive aroma. Of course if there's much of this dish is definitely smelled get a delicious, well so at ngilerkan if ngomonginnya. At a big event like this Eid is currently mandatory menu apart from the diamond because nearly everyone loved it. 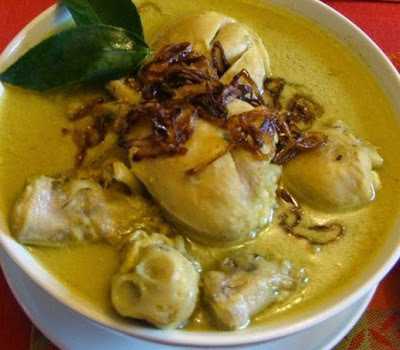 Perhaps many people do not know exactly how to make chicken curry with spices specialnya because it is still very secret really. Well if you are interested this time could make themselves listened in the following steps. Add chicken, stir well blended so that the seasoning, and cook until it changes color. Pour the coconut milk, add salt and sugar to taste. after mature lift.